While it is true that Mommie Soph’s “recipe book” had neither the volume nor diversity of a The Fanny Farmer Cookbook, there were elements in her canon that were true masterpieces. And I am proud to say, nay… incredibly proud to say that I acquired one! Sorry, it isn’t her gefilte fish, which by all rights should have won a Nobel Prize for Food. 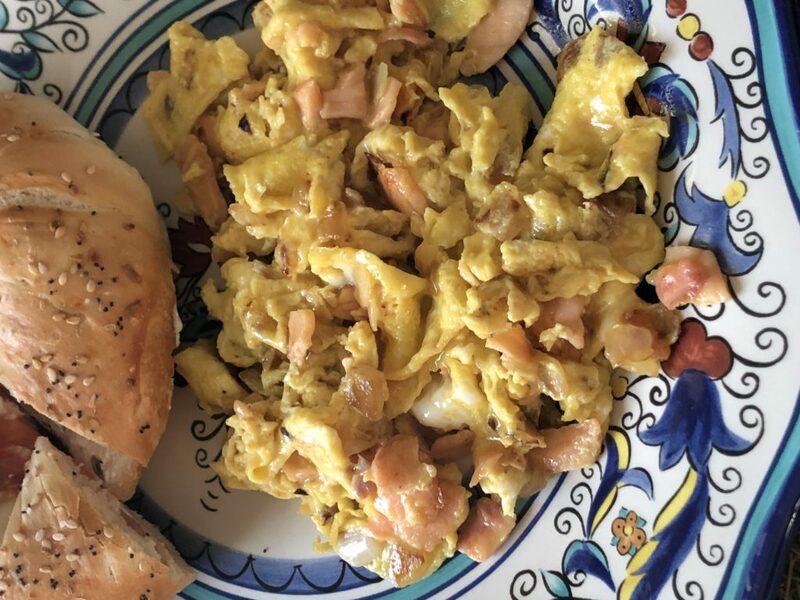 The dish that I have been able to replicate is her exquisite “Lox, Onions & Eggs.” This her one dish that I can truly say that thirds were never enough! I would watch her make it in our kitchen at 25 Alston Ave, the smell of the chopped onions frying in a healthy layer of melted butter was intoxicating. Once the onions had moved from translucent to just turning brown, more butter was added, then a good portion of chopped lox would be added to the pan. Once the lox turned from deep orange/red to a light pink, it was time to add some quantity of beaten eggs (and probably a bit more butter). And the she would set to business scrambling up this superb assemblage! I adored the finished product, and would scarf down two helpings in a blink of an eye, and would ready my plate for a touch more! I could actually hear my arteries congealing! When Mommie Soph passed I didn’t think too much of this cherished dish, until one day I saw it on Ratner’s menu in NYC! Well, I assumed that if anyone could make a good version of Lox, Onions & Eggs it would be a highly regarded Jewish establishment like Ratner’s on Second Ave. Wrong! It was a crushing disappointment! They “shortcutted” it! The Lox and Onions (raw, sliced, not diced!) were simply scrambled up with the eggs at the same time! And after that sad episode I decided that I was going to take-on making the dish á la Mommie Soph! And be in mind that this was in the day when my efforts at cooking were restricted to flipping burgers & steaks on the grill. Yes, I knew how critical it was to cook the onions and lox in advance of adding the eggs in order to successfully emulate the dish that Mommie Soph lovingly provided. Although I didn’t know the difference between a teaspoon and a tablespoon, I am confident that I created a dish that did Mommie Soph proud! n.b. Over the years I have scaled back use of butter without negatively impacting the end result. Even without the heavy handed use of butter, I doubt that anyone would mistake this dish as “full on healthy”. So be it!